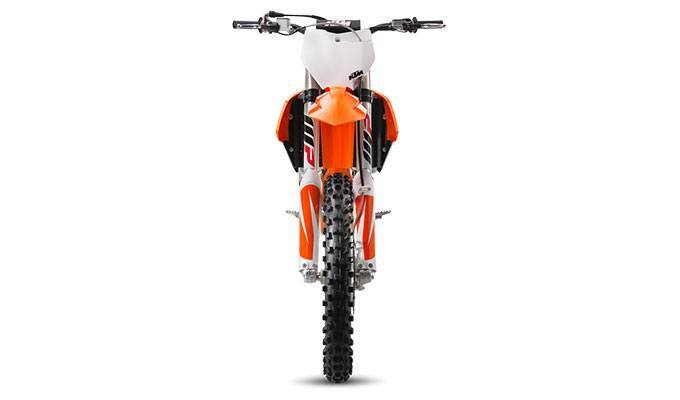 ENGINE: The engine of the KTM 350 SX-F features a compact and very light (60 lb.) construction. Its DOHC (double overhead camshaft) design with lightweight titanium valves and DLC coated cam followers allows for lively but strong engine characteristics. 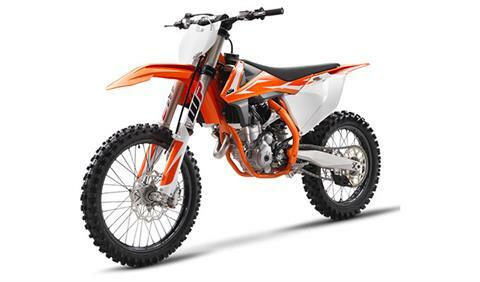 Fitted with the latest electronic fuel injection system and an E-starter, it has an extremely wide usable speed range, high performance and incredibly efficient rideability. 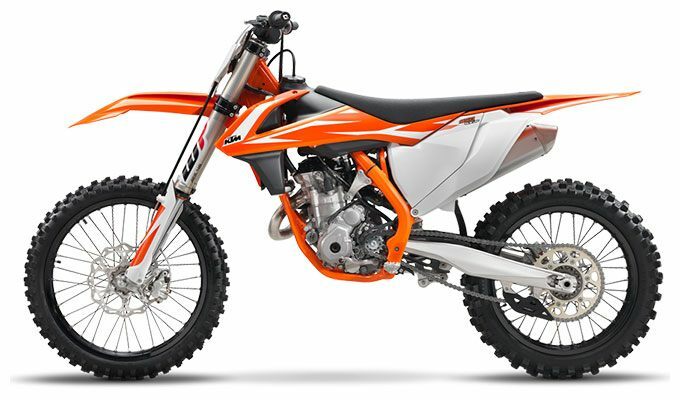 The KTM 350 SX-F engine shares the same layout as the 250 SX-F, resulting in its playful handling similar to a 250 machine by from reducing the moving masses to a minimum. CRANKSHAFT: The 350 SX-F’s crankshaft utilizes a short connecting rod, which makes for an overall compact and lightweight engine with a snappy power delivery. A plain big-end bearing with two force-fitted bearing shells runs directly on the crank pin. This design is a major prerequisite for the extremely high engine speeds and the unrivaled maximum power of the 350 cc engine. Not only that, it also enhances the engine’s durability, allowing long crankshaft service intervals – a customer benefit in respect of time, effort and cost. E-STARTER: The state-of-the-art Keihin Engine Management System with electronic fuel injection features a 44 mm throttle body. Thanks to its unique injector position, the engine’s response is instantaneous. And to make life even easier, separate systems for cold starts and idle adjustment await you. 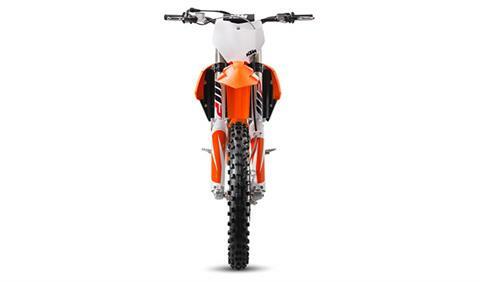 The lightweight ECU features a unique traction and launch control system for lightning-quick response when the gate drops and maximum grip thanks to different maps that sync with to the gear you’re in. It’s also possible to unleash an even more powerful mapping via the handlebar map switch. 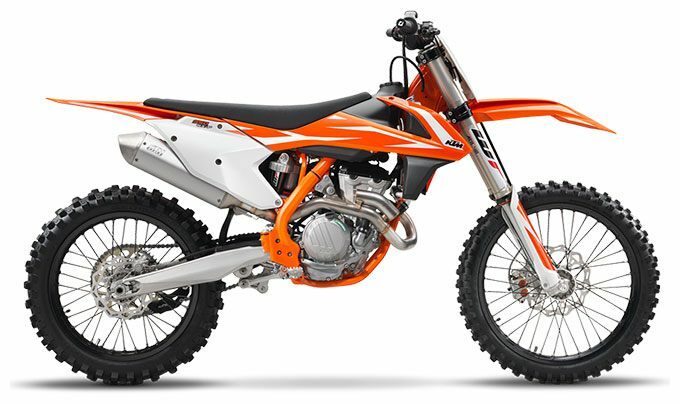 FORK: The lightweight WP AER 48 front fork, a 48 mm USD air-sprung fork developed by WP in close collaboration with KTM, is a split fork with separate functions for each leg. That means damping functions are on the right side, whereas the air spring is in the left. This left leg features a 2-chamber system with a capsuled air cartridge to prevent loss of air pressure. Should the outer seal start to leak the internal cartridge pressure will keep the bike in position. The air spring is easy to adjust to any rider weight via a single air valve. 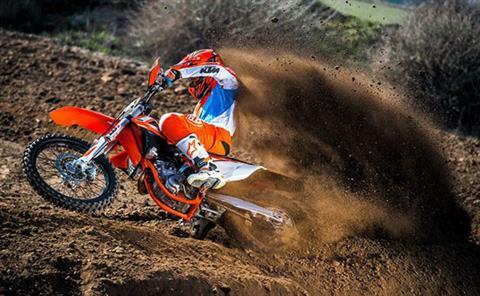 No extra special tools are required; the fork air pump is supplied with the bike. The right fork leg integrates a damping cartridge that tailors to all your damping needs. It can be adjusted to the track conditions and the rider’s preferences with a twist of a dial (compression from the top, rebound from the bottom, 30 clicks each). Right off the dealer floor, this fork (with reworked damping characteristics) is more comfortable and more sensitive than ever. But you can still hammer the hell out of it. BRAKES: You can’t brake any harder, better, faster or stronger. These high-tech Brembo babies are combined with lightweight wave discs made by Galfer. For 2018, the rear brake features a 10 mm longer brake pedal and you get new, less aggressive brake pads all round. HANDLEBAR MAP SELECT SWITCH: All 4-stroke models are equipped with a sophisticated new multi-functional handlebar map select switch, which does three things - activation of the traction control, activation of the launch control, selection of two power curves (Standard or Advanced). The traction control is a unique feature that none of the competitors can offer. 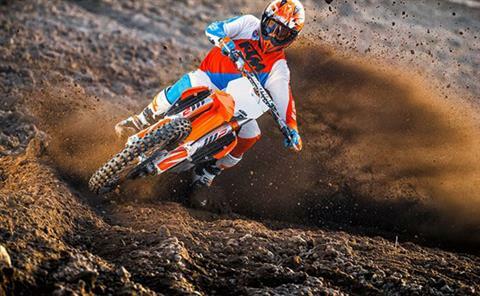 It guarantees more efficient traction when the track conditions are less than perfect. Push the button and reign supreme. With this map select switch the rider can also activate the launch control, which provides more efficient starts out of the gate so you can go for the hole shot, time and time again. How? It simply reduces the maximum engine speed for the very first moments of the start, in order to give you better control. Push both buttons when the engine idles and the EFI control lamp mounted on the upper triple clamps will let you know you are READY TO RACE. In addition, the map select switch gives the rider the chance to select an alternative, more powerful map beside the standard configuration. Welcome to the future. Front Rims - 1.60 x 21 in.